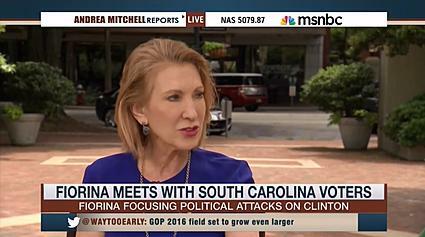 Republican presidential candidate Carly Fiorina argued that “titles are just titles” and Hillary Clinton’s “track record” includes the collapse of the Middle East and the failed Russian reset on Wednesday’s “Andrea Mitchell Reports” on MSNBC.Fiorina said, “I come from a world where titles are just titles, and talk is just talk. It’s only in politics where titles and words mean a lot. In the rest of the world, it’s actually about what have you done, actions speak louder than words. People want to know are your words and your actions consistent and are they consistent over time.